This past week was UN week at my school. As a new international teacher, I really didn’t know what to expect. There were no pictures shown at our planning meeting, and as the agenda items were checked off by the administration and experienced teachers, there weren’t any details given that would allow me to visualize what I’d see. Most of the teachers I work with have already been teaching in international schools around the world and this is all familiar to them. All I knew is that the homeroom teachers had a special schedule all week, which included activities outside the normal PYP curriculum. Some of these included flag making, map building and food tasting and then there would be a Parade of Nations on Friday. Monday morning began in assembly. A beautiful and heart-warming book, by Mem Fox, was read aloud by my new friend, and our Australian librarian called, Whoever You Are. Let me just say that this book is on my “To Buy in USA” list. This is a book to own if you have small children! Afterwards, a young woman and young man from the high school came and presented to our group on this history of the UN and on UNICEF. I learned so much! The work of the United Nations reaches every corner of the globe. Although best known for peacekeeping, peace-building, conflict prevention and humanitarian assistance, there are many other ways the United Nations and its System (specialized agencies, funds and programmes) affect our lives and make the world a better place. The Organization works on a broad range of fundamental issues, from sustainable development, environment and refugees protection, disaster relief, counter terrorism, disarmament and non-proliferation, to promoting democracy, human rights, gender equality and the advancement of women, governance, economic and social development and international health, clearing landmines, expanding food production, and more, in order to achieve its goals and coordinate efforts for a safer world for this and future generations. One of the reasons I knew I would love working in an international school was because I wanted to be influenced in my thoughts, in my prayers, in my teaching, in my art, in my personal philosophy of life on a global level. I felt my existence in the USA was too narrow. The school where I teach is an enormous melting pot of children and families. I don’t yet know the number of countries represented in our student body but I can assure you it is a lot! During the week special activities were implemented but on Thursday, one of the Grade 1 teachers ran downstairs to my art room and invited me to come upstairs and taste the assortment of foreign foods that had been brought in from our international families. Of course I followed her upstairs! I couldn’t believe my eyes! 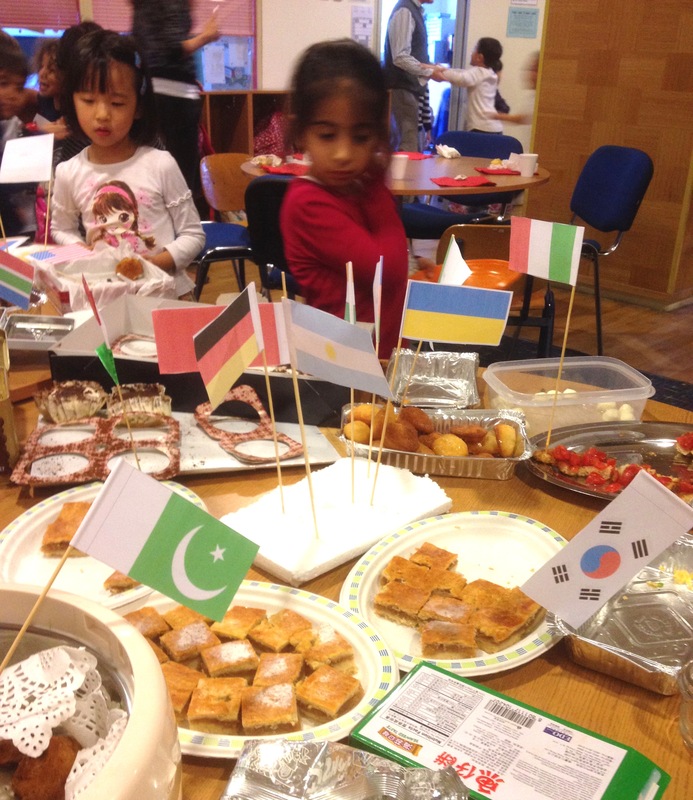 Delicious, savory and sweet foods were lovingly prepared by our school’s families and a buffet was spread out for all to enjoy “tastes from around the world”. I loved sampling the delicious foods. Each of the food trays was marked with a small flag designating the country from which the food was from. It was yummy! When I came to work on Friday, my eyes were in for a treat. 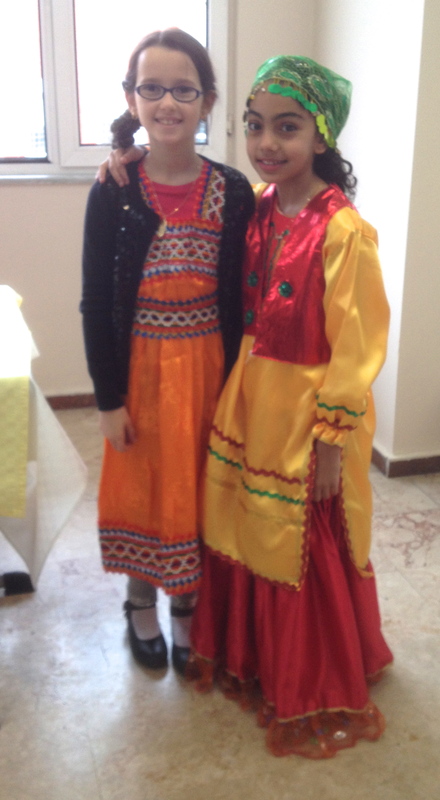 Traditional costumes, flags and hats were on the children as they marched proudly into school. I grabbed my camera and asked permission as I continued to shoot pictures of these lovely, beautiful children. Seeing them made me want to visit every country! It made me realize that next summer, when I go home to America, I will have to get some kind of “American” costume to wear on UN day next year! Here’s a shout out to my family and friends in the USA…this year, on July 4, PLEASE grab me a BIG American flag and some American “memorabilia”. I want to participate in costume next year. I had nothing special to wear. I can sense that I’m already starting to change…When I left the USA I held many negative feelings about my country, based on politics and economy. However, after being here just a few, short months, my views are beginning to broaden. During the Parade of Nations assembly, at the end of the day on Friday, I sat with a colleague who has taught in four international schools. We were both in amazement at the beautiful, colorful children and their traditional costumes that filled our entire auditorium. He whispered to me that in all the other international schools he’s taught in, although the students possessed an international passport, most of them were “from” the country that the school was located in. That is not the case at MEFIS. Our student population is from all over the world! Lucky me; our students are truly global! This teaching experience is like none that I’ve ever done before and I love it! Thanks, Mom! If you’ll remember my very first article on my blog was about my childhood international doll collection. The students looked like the dolls in my collection had just come to life! My heart is warmed from that long ago Christmas memory. Are any of them in Sophia’s things/ Thank you for posting. Much love.